Thank you to the Lake Country Museum and Archives for hosting our July Business After Hours event. 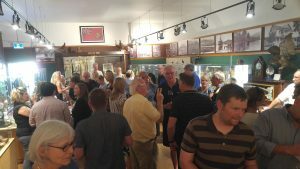 A huge crowd of over 40 members and non-members came together on a warm summer evening to socialize, network and learn more about our beautiful Lake Country Museum! Thank you to all the local businesses that donated door prizes, and congratulations to James Chapman from Alternatives Funeral and Cremation Services who won the 50/50 draw! The Lake Country Museum and Archives is located on Okanagan Center Road W. The Museum is dedicated to preserving the history of Lake Country and presenting it to the community and to visitors. If you haven’t had a chance to stop by yet, be sure to make time soon. Giving Back to Lake Country!